With defensive gameplay shored up (it may be tweaked, but the concept is final), I started thinking last week about the one section of gameplay I was still dissatisfied with: the offseason. For a quick review, the offseason gameplay basically involved one card being made available for each rating. Each card had a potential and a grade, and you could play three of these cards in an attempt to improve your team. Once you made your choices, there was a dice roll to determine whether the outcome was positive or negative. I really, really like the layout of that screen--it's colorful and sharp, and it's organized. 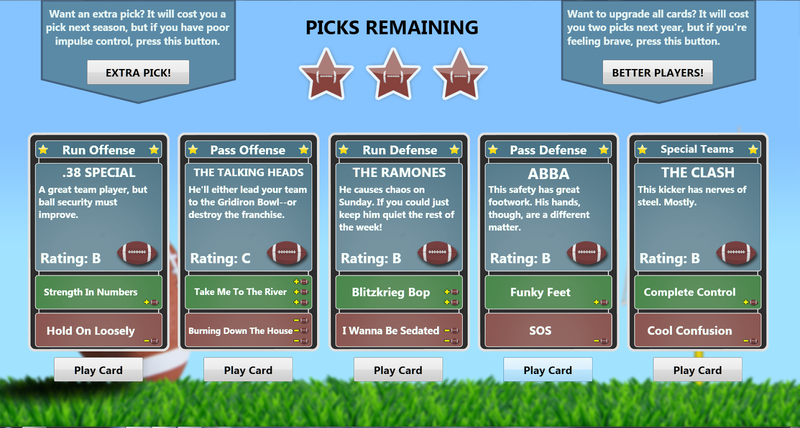 And I really like the card descriptions and the idea of using positive/negative songs from the same band. To me, that's pretty entertaining (your mileage may vary). Last week, though, while I was thinking about this portion of the game, it suddenly hit me what was wrong: I'd worked very hard on creating interesting content, but I hadn't worked very hard on creating interesting choices. So while I liked the card descriptions, I was using them to basically distract the player from the lack of interesting choices available to him. That's all wrong. What I needed to do was create interesting choices for the player before thinking about content at all. Once I realized what was wrong with the existing gameplay, an idea for something that I liked much more came very quickly, and it fixes one of the other things I really didn't like about the mini-game, which was the possibility of a negative outcome. Since the downside was as high as the upside, the player was almost completely dependent on the dice roll. That could be very frustrating/enraging/Hulk Smashing. All right, so let's fix that. I want the player to have more choices and more control over how he builds his team, but without the process being so complex that it becomes more difficult than the rest of the game--it still needs to be easy to understand. Here's a basic framework that I like: each rating has 5-6 player cards available. The player has an offseason budget (in dollars or points) that he can use to buy as many of these cards as he can afford. The budget is determined by team wins the previous season, so the better the team, the smaller the budget (to simulate bad teams in the NFL getting higher draft choices). The more expensive cards offer greater improvements, of course, and in most cases, the player will buy 2-4 cards each offseason, depending on his financial philosophy. There's still a chance that the card will be a bust, but it will be a low chance (10% or less), and if it does bust, it just doesn't improve that particular rating. A card won't ever make the rating go down. This setup offers two nice new features: one, if a player wants to do nothing but buy cards to improve his run offense, for example, he can do that. His only limit is his total budget. Also, he can carry over budget from year to year, so if there's one super-expensive card that he can't afford, he can actually wait until the next offseason. Here's one other addition. Several of the beta testers wanted in-game achievements, but I don't like in-game achievements because they don't build toward anything. With a budget, though, I saw an opportunity to reward the users who play through their games instead of simming. So there will be "coins" awarded for certain in-game moments (50+ yard gain on offense, or a 0 gain on defense) that will add to the offseason budget. It's not going to be a huge amount--probably capped at 15% or so of the base offseason budget--but it's a reward for the player, and it adds an additional layer of strategy that didn't exist before. There will be some sort of acknowledgement in-game that budget coins have been awarded, but I'm adding an option to turn off the notification, because I generally hate that crap while I'm playing a game. All right, so that's what's happening. This is the last bit of gameplay that needs to be changed--at least, it is to me. I think everything else is solid and plays like football, and this is a substantial improvement in the offseason mini-game. So once this is in (1-2 weeks, I'm guessing), core gameplay is basically done. For good, this time.